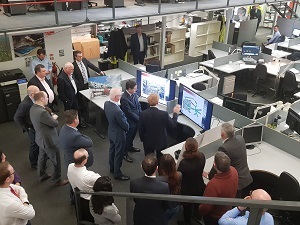 You are here: Home News OCSC Dublin staff welcome Minister for Finance & Public Expenditure and Reform, Paschal Donohoe TD. OCSC Dublin staff welcome Minister for Finance & Public Expenditure and Reform, Paschal Donohoe TD. 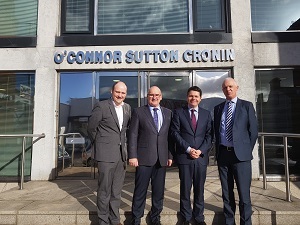 On Friday 9th February 2018, OCSC staff had the honour to welcome the Minister for Finance & Public Expenditure and Reform, Paschal Donohoe TD to our offices on Prussia Street. The Minister was accompanied by our Local Councillor, Ray McAdam. The Minister expressed his pride at the scale and quality of engineering design work being carried out by OCSC in his constituency. He particularly referenced the significant input OCSC has into the New Children’s Hospital, The Central Bank, the Luas Cross City and the Grangegorman Development. During his visit he experienced first-hand 3D modelling of buildings and OCSC’s BIM capability. Our staff were delighted that he took the time to visit all the disciplines and the visit concluded with speeches from OCSC Group Managing Director, Tony Horan and a reply by the Minister. Tony Horan’s speech welcomed the Minister and explained that this was the company’s 30th year in Business and that while we continue to win awards for our work we are passionate about assisting to deal with the current housing crisis. In reply the Minister said that he had often walked past the front door and didn’t realise the scale of the operation and the number of staff employed here. He said that the Government will shortly announce the details of the major investment in the National Planning Framework and hoped that OCSC would play a significant part in its delivery.